I just wanted to share this photo that Water Street Bookstore in Exeter, NH shared with me. Former Secretary of State and Presidential Candidate Hillary Clinton stopped in for a visit and purchased a copy of Little Elliot, Big City! I hope that Charlotte and Chelsea enjoy it. 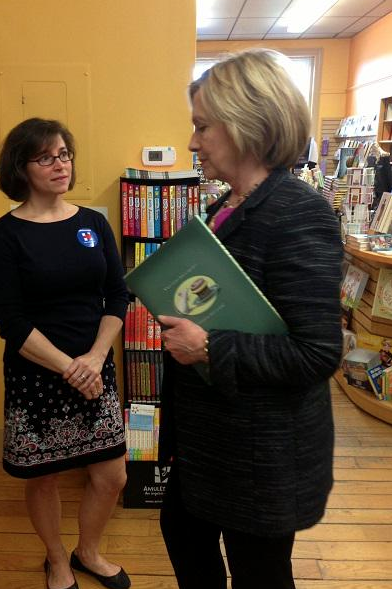 Shout out to Jill from Water Street Bookstore (left), who recommended Little Elliot, Big City to Hillary! Hillary and Chelsea are big friends of elephants. They have raised millions to fight the illegal ivory trade. Baby Charlotte also has an elephant themed nursery! I think Little Elliot has found a good home.